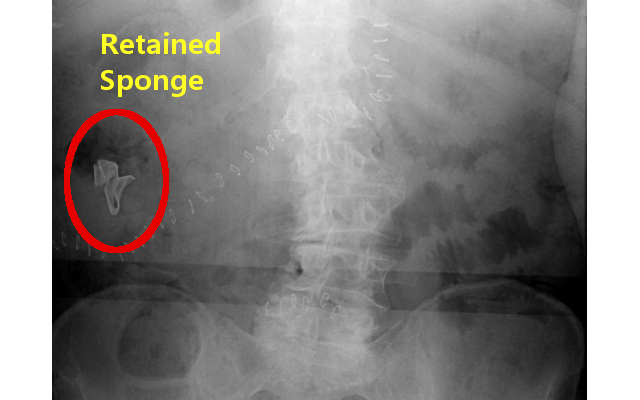 A retained foreign object is a nicer way of putting that the surgeon and their team left something behind. Something that was not supposed to be left behind, such as a sponge, surgical cap, clamp or other surgical instrument. Retained foreign objects are far more common than you would think. There are between 2,000 and 4,000 cases of retained foreign objects in the United States each year. Although it represents a small number in comparison to the number of procedures done nationwide, which is around 30 million, it is striking that it occurs with the frequency that it does. Hospitals and surgical facilities have strict guidelines for making sure that anything put into the body of a person undergoing a procedure be accounted for and removed, unless there is a medical reason for leaving the object in the body of the person. Without a medical reason for leaving the object behind, the hospital is subject to liability for any damages that the person incurs as a result of the foreign object being left behind in their body. Most retained foreign objects occur because the surgeon and the staff fail to account for each item placed into the person during surgery. Hospital procedures call for marking down what instrument or item was placed inside of the person during surgery and also requires them to note when it was removed. Operating rooms are highly efficient in this way. However, in the heat of surgery, especially emergency surgery, things may get overlooked in the “chaos” of the operating room. The amount of people in an operating room can range from around 4 all the way up to 10 people, each with a very specific job. 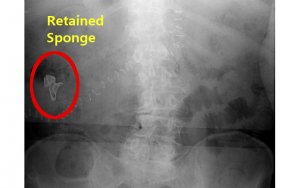 When an object is left in the body of a person, it is usually as a result of the surgeon and whoever was responsible for accounting for the sponges and surgical instruments used in the surgery. Who that may be could vary surgery to surgery depending on who is available for surgery at the time. INJURED BY A NEGLIGENT HOSPITAL? CALL THE TRUSTED LEGAL TEAM AT GUEST AND GRAY, P.C. If you have been injured as a result of a negligent hospital and its staff in the Dallas, Kaufman or Rockwall county areas, or anywhere in the State of Texas, you need to call the trusted personal injury team at Guest and Gray, P.C. Our firm is the largest and highest rated firm in both Kaufman and Rockwall counties. Our personal injury attorneys are caring, trusted and local. We pride ourselves in hard work and results.